CAL Garden & Yard is the resource for both serious home growers and recreational gardeners with tools, chemicals and decorations for every property from the small backyard to the country spread with acreage. Lawn Maintenance - Professional caliber lawn care products will keep your spread productive if your lawn spans generous acres or your personal patch of suburban green. Stock up on herbicides, fertilizers and lawn maintenance products from Agri-Fab, Scotts Lawns, True Value and Voluntary Purchasing Group to keep your lawn at its peak of green and disease resistant. They have aerators, dethatchers, dump carts and wheelbarrows to make your lawncare chores a snap. 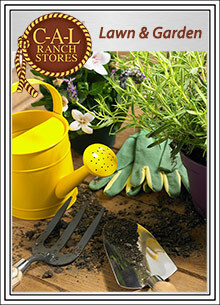 Gardening - Whether you tend a small city patch of flowers or a garden with rows of sweet corn, CAL Garden and Yard will be your one stop for every stage of caring for your garden, from preparing the soil, to planting seeds, growing and maintaining a healthy ranch, farm or beautiful suburban property. They carry gardening tools, irrigation parts, sprayers, spreaders and wood cutting equipment from Agri Fab, Gardex, Carhartt, L & L Nursery and top brands for every garden project you need to tackle. Woodcutting - Tackle your tree maintenance and wood cutting tasks with heavy duty tools from CAL Garden & Yard. Find axes, wood handle cutters, chain saws and chain saw blades that will make quick work of the wood pile or the back forty. Furniture and Decor - When it�s time to put your boots up, they have just the country porch rocker or hammock to do relaxation right. You will love a courtyard outdoor patio heater for cool nights under the stars, and garden barrel water fountains, birdbaths and patriotic flag pole brackets and accessories to outfit your spread right. To tackle every maintenance and cultivating project for your lawn and garden, this is the one stop place to shop the most well known names in garden and yard care.